G'Gina's Kitchenette: Beef Roast/Beef Dry Fry - Beef Ularthiyadu/Olaythiyadu - Hubby's Special!! "This is a journey of my life since I was all of 12 yrs when I started my hand in cooking to now with displays of my learning and creations of recipes from around the world. My inspiration and role model has always been my Mum who has always created dishes from around the world and excellently well. I do not believe I would ever match to her culinary skills. I remember the times she could cook and bake almost 4-5 dishes in one go without ever letting one go under cooked or burnt! I was born and raised in Dubai, UAE and recently moved to India for family reasons. Kitchenette just means that over the decades, my kitchen has changed from that of my mum's to my uncle and aunt's, to my home in UAE and now in India. Pala't'te, describes both global cuisines ('Palatte'-diverse flavours) and pleasing diverse 'Palates'." 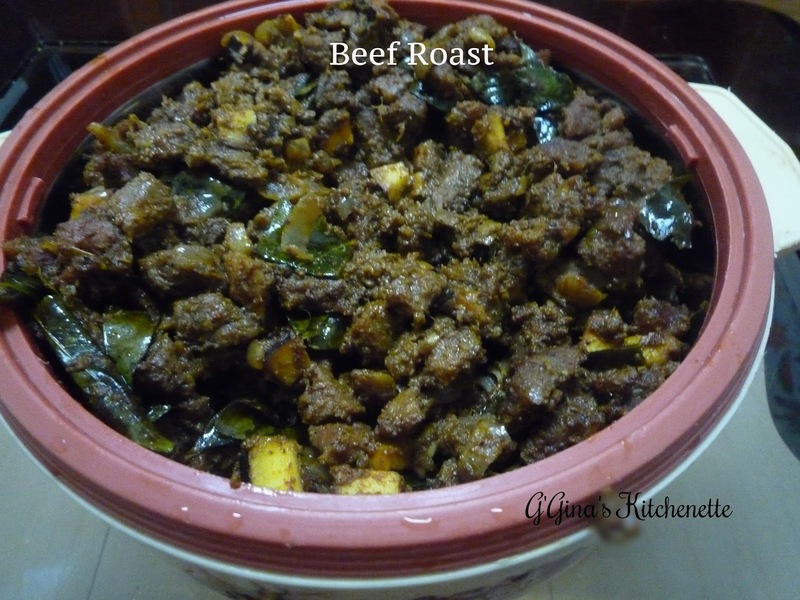 Beef Roast/Beef Dry Fry - Beef Ularthiyadu/Olaythiyadu - Hubby's Special!! I was only the helper this time just to get the spices ground or for the dicing and the clean up after. This is all him and his mum :) My MIL makes the best beef and cutlets by the way. Of course I love my mom's but they both are aces in their own way. 1. Drain the cleaned beef in a colander until all the water is completely drained. 2 . Meanwhile, fry the coconut in 1/2 tbsp of the oil till golden brown and add a pinch of turmeric. Set aside. 3. Add 1/2 tbsp of the oil to a wok and splutter the mustard seeds. 4. Add 1 of the diced onions and saute till golden brown. Then add the ginger and garlic and saute for a minute or until the garlic is slightly brown. 5. Make a paste with some water of some of the dry spices (11/2 tbsp of coriander powder, 11/2 tbsp of chili powder, 3/4 tbsp of Garam Masala and 1/2 tbsp of salt). 6. Add the masala paste to the wok and saute until the masala is cooked or leaves the sides of the wok. 7. Cook the raw beef with the prepared coconut, cooked masala and curry leaves in the pressure cooker for at least 45 minutes (5-6 whistles). Tip: Make sure you have added enough water to cover half the beef content. It does not have to cover the entire beef content as this a dry fry. 8. In the wok, heat the remaining oil and saute the remaining diced onions till golden brown. 9. Next add in the remaining coriander powder, chili powder, garam masala and the pepper powder and cook the masala. 10. Lower heat to low and add in the cooked beef and fry till the residual water gets absorbed. 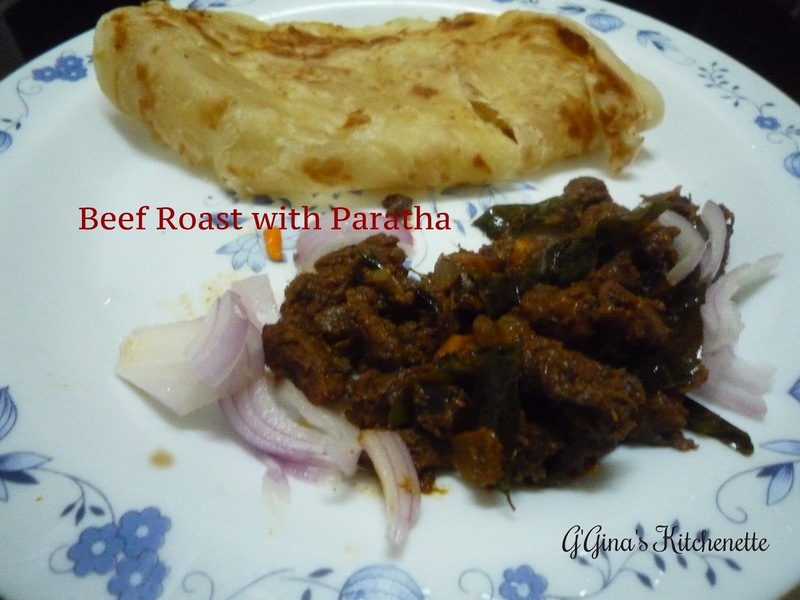 Serve hot with a flatbread of your choice - Paratha, chappatis or rotis, appam or rice. Tip: You can subsitute with chicken or soya chunks. Soya chunks actually work really well with this recipe! Will this recipe work with mutton as well? Would work like a mutton sukka? P.S The coconut goes in the masala right or will or be coconut pieces in the meat? Pratibha yes you can try it with Mutton as well. The coconut could go into the pressure cooker while cooking the meat. These are coconut pieces. But if you want to grate the coconut then it could go into the masala in the last frying process before the meat is added to the wok, i.e. after step 9. and before step 10. Let me know it turns out! Yumm!!! Believe me, I'm salivating here! 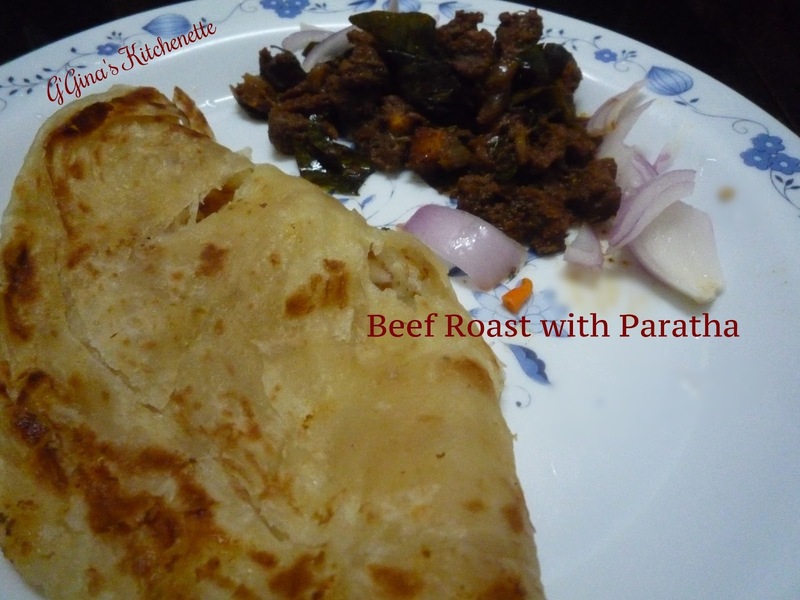 Porotta and Beef form a classic combo, never mind the cholesterol :-)). I do eat beef but I'd like to try it out with soya chunks too. Pinning away!! "I would love to hear your views and suggestions on my post. If you have tried my recipe and made alterations too, I would love to learn of it! Kindly do not post any links or advertisements as they would NOT get published. Waiting to hear from you!" "Mum has been the true chef...cooking and baking over 4-5 dishes in one go to perfection! Over the years I have learnt, been inspired and awed by the likes of Martin Yan with his famous line : "If Yan can cook so can you", Gordan Ramsay (I know! but he is amazing), Rachael Ray, MasterChef Australia's judges: Gary Mehigan, George Calombaris, Matt Preston, Matt Moran and several others. I never miss a chance to watch and learn or better yet smell, taste and learn.This has been since the start, I fail to follow recipes as well as I experiment and it turns out better in result through smell and taste!" ALL CONTENT AND PHOTOS ON THIS BLOG UNLESS OTHERWISE SPECIFIED ARE © G'GINA'S KITCHENETTE 2012-13. If you would like to use or reproduce any of my work presented on G'Gina's Kitchenette, kindly contact me on gginazkitchenette@gmail.com. Any unauthorised usage will constitute plagiarism.